"Austin" redirects here. For other uses, see Austin (disambiguation). Not to be confused with Austin County, Texas. 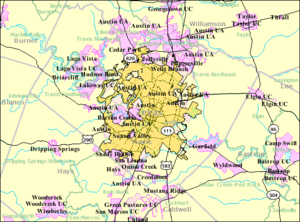 Nickname(s): "Live Music Capital of the World", "Silicon Hills", "ATX", "City of the Violet Crown"
Austin ( i/ˈɒstᵻn, ˈɔː-/) is the capital of the U.S. state of Texas and the seat of Travis County. It is the 11th-most populous city in the U.S. and the 4th-most populous in Texas. It is the fastest growing large city in the United States and the second most populous capital city after Phoenix, Arizona. As of the U.S. Census Bureau's July 1, 2015 estimate, Austin has a population of 931,830. Located in Central Texas in the foothills of Texas Hill Country, the city is home to numerous lakes, rivers, and waterways including Lady Bird Lake, Barton Springs, McKinney Falls, the Colorado River, Lake Travis, and Lake Walter E. Long. It is the cultural and economic center of the Austin–Round Rock metropolitan area, which had an estimated population of 2,056,405 as of July 1, 2016. In the 1830s, pioneers began to settle the area in central Austin along the Colorado River. In 1839, the site was officially chosen to replace Houston as the new capital of the Republic of Texas and was incorporated under the name "Waterloo." Shortly thereafter, the name was changed to "Austin" in honor of Stephen F. Austin, the "Father of Texas" and the republic's first secretary of state. The city subsequently grew throughout the 19th century and became a center for government and education with the construction of the Texas State Capitol and the University of Texas at Austin. After a lull in growth from the Great Depression, Austin resumed its development into a major city and, by the 1980s, it emerged as a center for technology and business. A number of Fortune 500 companies have headquarters or regional offices in Austin, including Amazon.com, Apple Inc., Cisco, eBay, Google, IBM, Intel, Oracle Corporation, Texas Instruments, 3M, and Whole Foods Market. Dell's worldwide headquarters is located in nearby Round Rock, a suburb of Austin. Residents of Austin are known as Austinites. They include a diverse mix of government employees, college students, musicians, high-tech workers, blue-collar workers, and a vibrant LGBT community. The city's official slogan promotes Austin as "The Live Music Capital of the World," a reference to the many musicians and live music venues within the city, as well as the long-running PBS TV concert series Austin City Limits. The city also adopted "Silicon Hills" as a nickname in the 1990s due to a rapid influx of technology and development companies. In recent years, some Austinites have also adopted the unofficial slogan "Keep Austin Weird," which refers to the desire to protect small, unique, and local businesses from being overrun by large corporations. In the late 1800s, Austin was known as the "City of the Violet Crown" because of the colorful glow of light across the hills just after sunset. Even today, many Austin businesses use the term "Violet Crown" in their name. Austin is known as a "clean-air city" for its stringent no-smoking ordinances that apply to all public places and buildings, including restaurants and bars. The FBI ranked Austin as the second-safest major city in the U.S. for the year 2012. U.S. News & World Report named Austin the best place to live in the U.S. in 2017. Austin, Travis County and Williamson County have been the site of human habitation since at least 9200 BC. The area's earliest known inhabitants lived during the late Pleistocene (Ice Age) and are linked to the Clovis culture around 9200 BC (11,200 years ago), based on evidence found throughout the area and documented at the much-studied Gault Site, midway between Georgetown and Fort Hood. When settlers arrived from Europe, the Tonkawa tribe inhabited the area. The Comanches and Lipan Apaches were also known to travel through the area. Spanish colonists, including the Espinosa-Olivares-Aguirre expedition, traveled through the area for centuries, though few permanent settlements were created for some time. In 1730, three missions from East Texas were combined and reestablished as one mission on the south side of the Colorado River, in what is now Zilker Park, in Austin. The mission was in this area for only about seven months, and then was moved to San Antonio de Béxar and split into three missions. In the mid-18th century, the San Xavier missions were along the Colorado River, in what is now western Milam County, to facilitate exploration. Early in the 19th century, Spanish forts were established in what are now Bastrop and San Marcos. Following Mexico's independence, new settlements were established in Central Texas, but growth in the region was stagnant because of conflicts with the regional Native Americans. In 1835–1836, Texans fought and won independence from Mexico. Texas thus became an independent country with its own president, congress, and monetary system. After Vice President Mirabeau B. Lamar visited the area during a buffalo-hunting expedition between 1837 and 1838, he proposed that the republic's capital, then in Houston, be relocated to the area situated on the north bank of the Colorado River near the present-day Congress Avenue Bridge. In 1839, the Texas Congress formed a commission to seek a site for a new capital to be named for Stephen F. Austin. Mirabeau B. Lamar, second president of the newly formed Republic of Texas, advised the commissioners to investigate the area named Waterloo, noting the area's hills, waterways, and pleasant surroundings. Waterloo was selected and the name Austin was chosen as the town's new name. The location was seen as a convenient crossroads for trade routes between Santa Fe and Galveston Bay, as well as routes between northern Mexico and the Red River. Edwin Waller was picked by Lamar to survey the village and draft a plan laying out the new capital. The original site was narrowed to 640 acres (259 ha) that fronted the Colorado River between two creeks, Shoal Creek and Waller Creek, which was later named in his honor. 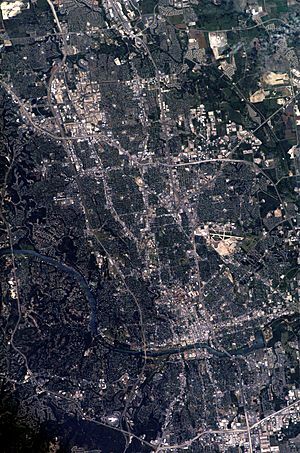 The 14-block grid plan was bisected by a broad north-south thoroughfare, Congress Avenue, running up from the river to Capital Square, where the new Texas State Capitol was to be constructed. A temporary one-story capitol was erected on the corner of Colorado and 8th Streets. On August 1, 1839, the first auction of 217 out of 306 lots total was held. The grid plan Waller designed and surveyed now forms the basis of downtown Austin. In 1840, a series of conflicts between the Texas Rangers and the Comanches, known as the Council House Fight and the Battle of Plum Creek, finally pushed the Comanches westward, mostly ending conflicts in Central Texas. Settlement in the area began to expand quickly. Travis County was established in 1840, and the surrounding counties were mostly established within the next two decades. Initially, the new capital thrived. But Lamar's political enemy, Sam Houston, used two Mexican army incursions to San Antonio as an excuse to move the government. Sam Houston fought bitterly against Lamar's decision to establish the capital in such a remote wilderness. The men and women who traveled mainly from Houston to conduct government business were intensely disappointed as well. By 1840, the population had risen to 856, of whom nearly half fled from Austin when Congress recessed. The resident Black population listed in January of this same year was 176. The fear of Austin's proximity to the Indians and Mexico, which still considered Texas a part of their land, created an immense motive for Sam Houston, the first and third President of the Republic of Texas, to relocate the capital once again in 1841. Upon threats of Mexican troops in Texas, Houston raided the Land Office to transfer all official documents to Houston for safe keeping in what was later known as the Archive War, but the people of Austin would not allow this unaccompanied decision to be executed. The documents stayed, but the capital would temporarily move from Austin to Houston to Washington-on-the-Brazos. Without the governmental body, Austin's population declined to a low of only a few hundred people throughout the early 1840s. The voting by the fourth President of the Republic, Anson Jones, and Congress, who reconvened in Austin in 1845, settled the issue to keep Austin the seat of government as well as annex the Republic of Texas into the United States. In 1860, 38% of Travis County residents were slaves. In 1861, with the outbreak of the American Civil War, voters in Austin and other Central Texas communities voted against secession. However, as the war progressed and fears of attack by Union forces increased, Austin contributed hundreds of men to the Confederate forces. The African American population of Austin swelled dramatically after the enforcement of the Emancipation Proclamation in Texas by Union General Gordon Granger at Galveston in an event commemorated as Juneteenth. Black communities such as Wheatville, Pleasant Hill, and Clarksville were established with Clarksville being the oldest surviving freedomtown ‒ the original post-Civil War settlements founded by former African-American slaves ‒ west of the Mississippi River. 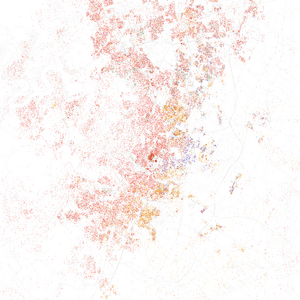 In 1870, blacks made up 36.5% of Austin's population. The postwar period saw dramatic population and economic growth. The opening of the Houston and Texas Central Railway (H&TC) in 1871 turned Austin into the major trading center for the region with the ability to transport both cotton and cattle. The Missouri, Kansas, and Texas (MKT) line followed close behind. Austin was also the terminus of the southernmost leg of the Chisholm Trail and "drovers" pushed cattle north to the railroad. Cotton was one of the few crops produced locally for export and a cotton gin engine was located downtown near the trains for "ginning" cotton of its seeds and turning the product into bales for shipment. However, as other new railroads were built through the region in the 1870s, Austin began to lose its primacy in trade to the surrounding communities. In addition, the areas east of Austin took over cattle and cotton production from Austin, especially in towns like Hutto and Taylor that sit over the blackland prairie, with its deep, rich soils for producing cotton and hay. In September 1881, Austin public schools held their first classes. The same year, Tillotson Collegiate and Normal Institute (now part of Huston-Tillotson University) opened its doors. The University of Texas at Austin held its first classes in 1883, although classes had been held in the original wooden state Capitol for four years before. 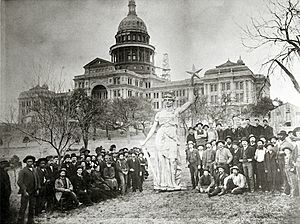 During the 1880s, Austin gained new prominence as the state capitol building was completed in 1888 and claimed as the seventh largest building in the world. In the late 19th century, Austin expanded its city limits to more than three times its former area, and the first granite dam was built on the Colorado River to power a new street car line and the new "moon towers". Unfortunately, the first dam washed away in a flood on April 7, 1900. In the 1920s and 1930s, Austin launched a series of civic development and beautification projects that created much of the city's infrastructure and many of its parks. In addition, the state legislature established the Lower Colorado River Authority (LCRA) that, along with the city of Austin, created the system of dams along the Colorado River to form the Highland Lakes. These projects were enabled in large part because the Public Works Administration provided Austin with greater funding for municipal construction projects than other Texas cities. Bob Bullock Texas History Museum in Austin. Its mission is to "tell The Story of Texas". During the early twentieth century, a three-way system of social segregation emerged in Austin, with Anglos, African Americans and Mexicans being separated by custom or law in most aspects of life, including housing, health care, and education. Many of the municipal improvement programs initiated during this period—such as the construction of new roads, schools, and hospitals—were deliberately designed to institutionalize this system of segregation. Racial segregation increased in Austin during the first half of the twentieth century, with African Americans and Mexicans experiencing high levels of discrimination and social marginalization. In 1940, the destroyed granite dam on the Colorado River was finally replaced by a hollow concrete dam that formed Lake McDonald (now called Lake Austin) and which has withstood all floods since. In addition, the much larger Mansfield Dam was built by the LCRA upstream of Austin to form the flood-control lake, Lake Travis. In the early 20th century, the Texas Oil Boom took hold, creating tremendous economic opportunities in Southeast Texas and North Texas. The growth generated by this boom largely passed by Austin at first, with the city slipping from fourth largest to 10th largest in Texas between 1880 and 1920. After the mid-20th century, Austin became established as one of Texas' major metropolitan centers. In 1970, the United States Census Bureau reported Austin's population as 14.5% Hispanic, 11.9% black, and 73.4% non-Hispanic white. In the late 20th century, Austin emerged as an important high tech center for semiconductors and software. The University of Texas at Austin emerged as a major university. The 1970s saw Austin's emergence in the national music scene, with local artists such as Willie Nelson, Asleep at the Wheel, and Stevie Ray Vaughan and iconic music venues such as the Armadillo World Headquarters. Over time, the long-running television program Austin City Limits, its namesake Austin City Limits Festival, and the South by Southwest music festival solidified the city's place in the music industry. 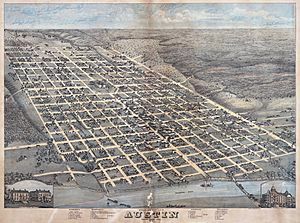 The most southerly of the capitals of the contiguous forty-eight states, Austin is located in Central Texas, along the Balcones Escarpment and Interstate 35, 150 miles (240 kilometres) northwest of Houston. It is also 160 miles (260 kilometres) south of Dallas and 75 miles (121 kilometres) north of San Antonio. Its elevation varies from 425 feet (130 m) to approximately 1,000 feet (305 m) above sea level. In 2010, the city occupied a total area of 271.8 square miles (704 km2). Approximately 6.9 square miles (18 km2) of this area is water. Austin is situated on the Colorado River, with three man-made (artificial) lakes within the city limits: Lady Bird Lake (formerly known as Town Lake), Lake Austin (both created by dams along the Colorado River), and Lake Walter E. Long that is partly used for cooling water for the Decker Power Plant. Mansfield Dam and the foot of Lake Travis are located within the city's limits. Lady Bird Lake, Lake Austin, and Lake Travis are each on the Colorado River. 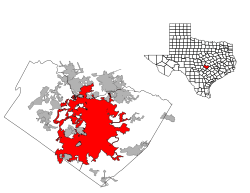 As a result of its straddling the Balcones Fault, much of the eastern part of the city is flat, with heavy clay and loam soils, whereas, the western part and western suburbs consist of rolling hills on the edge of the Texas Hill Country. Because the hills to the west are primarily limestone rock with a thin covering of topsoil, portions of the city are frequently subjected to flash floods from the runoff caused by thunderstorms. To help control this runoff and to generate hydroelectric power, the Lower Colorado River Authority operates a series of dams that form the Texas Highland Lakes. The lakes also provide venues for boating, swimming, and other forms of recreation within several parks on the lake shores. Austin is located at the intersection of four major ecological regions, and is consequently a temperate-to-hot green oasis with a highly variable climate having some characteristics of the desert, the tropics, and a wetter climate. The area is very diverse ecologically and biologically, and is home to a variety of animals and plants. Notably, the area is home to many types of wildflowers that blossom throughout the year but especially in the spring, including the popular bluebonnets, some planted in an effort by "Lady Bird" Johnson, wife of former President Lyndon Johnson. A popular point of prominence in Austin is Mount Bonnell. At about 780 feet (238 m) above sea level, it is a natural limestone formation overlooking Lake Austin on the Colorado River, with an observation deck about 200 feet (61 m) below its summit. The soils of Austin range from shallow, gravelly clay loams over limestone in the western outskirts to deep, fine sandy loams, silty clay loams, silty clays or clays in the city's eastern part. Some of the clays have pronounced shrink-swell properties and are difficult to work under most moisture conditions. Many of Austin's soils, especially the clay-rich types, are slightly to moderately alkaline and have free calcium carbonate. Austin has several rock climbing locations. Rock climbing can be found at three Austin parks: Barton Creek Greenbelt, Bull Creek Park and McKinney Falls State Park. The sport-climbing routes at Barton Creek Greenbelt–with its many vertical to overhanging walls–offer challenges to both the beginner and advanced climber. The skyline of Austin, TX viewed at sunrise from Zilker Park. Austin's skyline historically was modest, dominated by the Texas State Capitol and the University of Texas Main Building (more commonly referred to as the "clock tower"). However, many new high-rise towers have been constructed since 2000 -- Austin's ten tallest buildings were completed after 2003. The city's tallest building, The Austonian, was topped out on September 17, 2009. Austin is currently undergoing a skyscraper boom, which includes recent construction on the now complete 360 Condominiums at 563 feet (172 m), Spring (condominiums), the Austonian at 683 feet (208 m), and several other office, hotel and residential buildings. Downtown's buildings are somewhat spread out, partly due to a restriction that preserves the view of the Texas State Capitol from various locations around Austin (known as the Capitol View Corridors). At night, parts of Austin are lit by "artificial moonlight" from Moonlight Towers built to illuminate the central part of the city. The 165-foot (50 m) moonlight towers were built in the late 19th century and are now recognized as historic landmarks. Only 15 of the 31 original innovative towers remain standing in Austin, and none remain in any of the other cities where they were installed. The towers are featured in the 1993 film Dazed and Confused. The central business district of Austin is home to the tallest condo towers in the state, with the under construction Independent (58 stories and 690 feet (210 metres). tall) and The Austonian (topping out at 56 floors and 685 feet (209 metres). tall). The Independent will supplant The Austonian as the tallest all-residential building in the U.S. west of the Mississippi River when completed in 2018. In 2005, then-Mayor Will Wynn set out a goal of having 25,000 people living Downtown by 2015. Although Downtown's growth did not meet this goal, Downtown's residential population did surge from an estimated 5,000 in 2005 to 12,000 in 2015. The skyline has drastically changed in recent years, and the residential real estate market has remained relatively strong. As of December 2016, there are 31 high-rise projects either under construction, approved or planned to be completed in Austin's downtown core between 2017 and 2020. Sixteen of those are set to rise above 400 feet (120 metres). tall, including four above 600', and eight above 500'. An additional 15 towers are slated to stand between 300' and 399' tall. Downtown growth has been aided by the presence of a popular live music and nightlife scene, museums, restaurants, and Lady Bird Lake, considered one of the city's best recreational spots. The 2nd Street District consists of several new residential projects, restaurants, upscale boutiques and other entertainment venues, as well as Austin's City Hall. Across 2nd Street from Austin's City Hall is the new ACL Live @ the Moody Theatre where the long-running PBS program Austin City Limits, is filmed. It is located at the base of the new 478 feet (146 m) W Hotel. The South by Southwest is a music, film and interactive festival which occurs over five days each March in downtown Austin, and includes one of the world's largest music festivals; with more than 3,000 acts playing in more than 100 venues. Under the Köppen climate classification, Austin has a humid subtropical climate. This climate is typified by very long, hot summers; warm transitional seasons; and short, mild winters. Austin averages 34.32 inches (872 mm) of annual rainfall and it is distributed mostly evenly throughout the year, though May and June are generally the wettest months. Sunshine is abundant during all seasons, with nearly 2,650 hours, or 60.3% of the possible total, of bright sunshine per year. Summers in Austin are very hot. Average July and August highs frequently reach the high-90s °F (34–36 °C), and triple digits are common. Highs reach 90 °F (32 °C) on 116 days per year, and 100 °F (38 °C) on 18 days per year. The highest ever recorded temperature was 112 °F (44 °C) occurring on September 5, 2000, and August 28, 2011. Summer humidity is inconsistent and is highly dependent on the shifting patterns of air flow and wind direction. Humidity rises when the air drifts inland from the Gulf of Mexico, but decreases significantly when the air is channeled through the Chihuahuan Desert of West Texas. Winters in Austin are mild. Daytime highs in December and January average 63 °F (17 °C) and 62 °F (17 °C), respectively, and the overnight low reaches or exceeds freezing only 19 times per year. The temperature falls below 45 °F (7 °C) during 88 evenings per year, including most nights between mid-December and mid-February. The lowest ever recorded temperature was −2 °F (−19 °C) on January 31, 1949. Roughly every two years Austin experiences an ice storm that freezes roads over and cripples travel in the city for 24 to 48 hours. When Austin received 0.04 inches (1 mm) of ice on January 24, 2014, there were 278 vehicular collisions. Similarly, snowfall is exceptionally rare in Austin. A snow event of 0.9 inches (2 cm) on February 4, 2011, caused more than 300 car crashes. A 13-inch (33 cm) snowstorm brought the city to a near standstill in 1985. The 2011 Texas drought dried up much of Central Texas water ways. 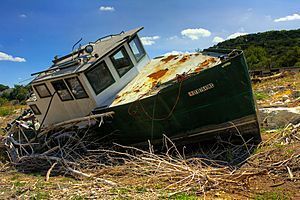 This boat was left to sit in the middle of what is normally a branch of Lake Travis, part of the Colorado River. From October 2010 through September 2011, both major reporting stations in Austin, Camp Mabry and Bergstrom Int'l, had the least rainfall of a water year on record, receiving less than a third of normal precipitation. This was a result of La Niña conditions in the eastern Pacific Ocean where water was significantly cooler than normal. David Brown, a regional official with the National Oceanic and Atmospheric Administration, has explained that "these kinds of droughts will have effects that are even more extreme in the future, given a warming and drying regional climate." At the 2000 United States Census, there were 656,562 people, 265,649 households, and 141,590 families residing in the city (roughly comparable in size to San Francisco, Leeds, UK; and Ottawa, Ontario, Canada). The population density was 2,610.4 inhabitants per square mile (1,007.9/km2). There were 276,842 housing units at an average density of 1,100.7 per square mile (425.0/km2). There were 265,648 households out of which 26.8% had children under the age of 18 living with them, 38.1% were married couples living together, 10.8% had a female householder with no husband present, and 46.7% were non-families. 32.8% of all households were made up of individuals and 4.6% had someone living alone who was 65 years of age or older. The average household size was 2.40 and the average family size was 3.14. In the city, the population was spread out with 22.5% under the age of 18, 16.6% from 18 to 24, 37.1% from 25 to 44, 17.1% from 45 to 64, and 6.7% who were 65 years of age or older. The median age was 30 years. For every 100 females there were 105.8 males. 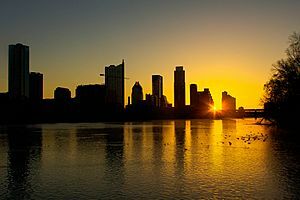 A 2014 University of Texas study stated that Austin was the only U.S. city with a fast growth rate between 2000 and 2010 with a net loss in African-Americans. As of 2014[update], Austin's African-American and Non-Hispanic White percentage share of the total population is declining despite the absolute number of both ethnic groups increasing. Austin's Non-Hispanic White population first dropped below 50% in 2005. The rapid growth of the Hispanic and Asian population has outpaced all other ethnic groups in the city. According to one survey completed in 2014, it is estimated that at least 5.3% (48,000+) of Austin's residents identify as Lesbian, Gay, Bisexual, or Transgender. Austin had the third highest rate in the nation. "Keep Austin Weird" has been a local motto for years, featured on bumper stickers and T-shirts. This motto has not only been used in promoting Austin's eccentricity and diversity, but is also meant to bolster support of local independent businesses. According to the 2010 book, Weird City, the phrase was begun by a local Austin Community College librarian, Red Wassenich, and his wife, Karen Pavelka, who were concerned about Austin's "rapid descent into commercialism and overdevelopment." The slogan has been interpreted many ways since its inception, but remains an important symbol for many Austinites who wish to voice concerns over rapid growth and irresponsible development. Austin has a long history of vocal citizen resistance to development projects perceived to degrade the environment, or to threaten the natural and cultural landscapes. According to the Nielsen Company, adults in Austin read and contribute to blogs more than those in any other U.S. metropolitan area. Austin residents have the highest internet usage in all of Texas. Austin was selected as the No. 2 Best Big City in "Best Places to Live" by Money magazine in 2006, and No. 3 in 2009, and also the "Greenest City in America" by MSN. According to Travel & Leisure magazine, Austin ranks No. 1 on the list of cities with the best people, referring to the personalities and attributes of the citizens. In 2012, the city was listed among the 10 best places to retire in the U.S. by CBS Money Watch. Recently in 2015, Forbes listed Austin as #1 Boom Town because of its economic strength, including jobs among other appealing attributes. South Congress is a shopping district stretching down South Congress Avenue from Downtown. This area is home to coffee shops, eccentric stores, restaurants, food trucks, trailers and festivals. It prides itself on "Keeping Austin Weird", especially with development in the surrounding area(s). Old Austin is an adage often used by the native citizens in Austin, Texas when being nostalgic to refer to the olden days of the capital city of Texas. Although Austin is also known internationally as the live music capital of the world and its catch phrase/slogan Keep Austin Weird can be heard echoed in places as far as Buffalo, NY and Santa Monica, CA - the term Old Austin refers to a time when the city was smaller and better known for its lack of traffic, hipsters, and urban sprawl. It is often employed by longtime residents expressing displeasure at the rapidly changing culture. 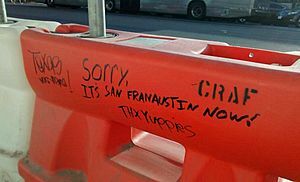 Construction barrier on South Congress with sentiment towards growth of the city. The growth and popularity of Austin can be seen by the expansive development taking place in its downtown landscape. Forbes ranked Austin as the second fastest-growing city in 2015. This growth can have a negative impact on longtime small businesses that cannot keep up with the expenses associated with gentrification and the rising cost of real estate. Rear photo of the Emma S. Barrientos Mexican American Cultural Center, located on Lady Bird Lake at 600 River Street in Austin. The center sponsors ethnic cultural events, including an annual celebration to the memory of labor figure Cesar Chavez. The O. Henry House Museum hosts the annual O. Henry Pun-Off, a pun contest where the successful contestants exhibit wit akin to that of the author William Sydney Porter. Other annual events include Eeyore's Birthday Party, Spamarama, Austin Gay Pride, the Austin Reggae Festival in April, Kite Festival, Texas Craft Brewers Festival in September, Art City Austin in April, East Austin Studio Tour in November, and Carnaval Brasileiro in February. Sixth Street features annual festivals such as the Pecan Street Festival and Halloween night. 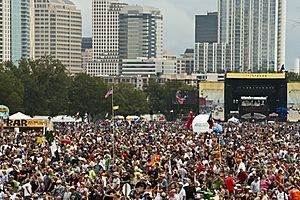 The three-day Austin City Limits Music Festival has been held in Zilker Park every year since 2002. Every year around the end of March and the beginning of April, Austin is home to "Texas Relay Weekend." Austin's Zilker Park Tree is a Christmas display made of lights strung from the top of a Moonlight tower in Zilker Park. The Zilker Tree is lit in December along with the "Trail of Lights," an Austin Christmas tradition. The Trail of Lights were cancelled four times, first starting in 2001 and 2002 due to the September 11 Attacks, and again in 2010 and 2011 due to budget shortfalls, but the trail was turned back on for the 2012 holiday season. As Austin's official slogan is The Live Music Capital of the World, the city has a vibrant live music scene with more music venues per capita than any other U.S. city. Austin's music revolves around the many nightclubs on 6th Street and an annual film/music/interactive festival known as South by Southwest (SXSW). The concentration of restaurants, bars, and music venues in the city's downtown core is a major contributor to Austin's live music scene, as the zip code encompassing the downtown entertainment district hosts the most bar or alcohol-serving establishments in the U.S. The longest-running concert music program on American television, Austin City Limits, is recorded at ACL Live at The Moody Theater. Austin City Limits and C3 Presents produce the Austin City Limits Music Festival, an annual music and art festival held at Zilker Park in Austin. Other music events include the Urban Music Festival, Fun Fun Fun Fest, Chaos In Tejas and Old Settler's Music Festival. Austin Lyric Opera performs multiple operas each year (including the 2007 opening of Philip Glass's Waiting for the Barbarians, written by University of Texas at Austin alumnus J. M. Coetzee). The Austin Symphony Orchestra performs a range of classical, pop and family performances and is led by Music Director and Conductor Peter Bay. Austin hosts several film festivals including SXSW Film Festival and Austin Film Festival, which hosts international films. In 2004 the city was first in MovieMaker Magazine's annual top ten cities to live and make movies. Austin has been the location for a number of motion pictures, partly due to the influence of The University of Texas at Austin Department of Radio-Television-Film. Films produced in Austin include The Texas Chain Saw Massacre (1974), Songwriter (1984), Man of the House, Secondhand Lions, Chainsaw Massacre 2, Nadine, Waking Life, Spy Kids,The Faculty, Dazed and Confused, Wild Texas Wind, Office Space, The Life of David Gale, Miss Congeniality, Doubting Thomas, Slacker, Idiocracy, The New Guy, Hope Floats, The Alamo, Blank Check, The Wendall Baker Story, School of Rock, A Slipping-Down Life, A Scanner Darkly, Saturday Morning Massacre, and most recently, the Coen brothers' True Grit, Grindhouse, Machete, How to Eat Fried Worms, Bandslam and Lazer Team. In order to draw future film projects to the area, the Austin Film Society has converted several airplane hangars from the former Mueller Airport into filmmaking center Austin Studios. Projects that have used facilities at Austin Studios include music videos by The Flaming Lips and feature films such as 25th Hour and Sin City. Austin also hosted the MTV series, The Real World: Austin in 2005. The film review websites Spill.com and Ain't It Cool News are based in Austin. Rooster Teeth Productions, creator of popular web series such as Red vs. Blue, and RWBY is also located in Austin. Austin has a strong theater culture, with dozens of itinerant and resident companies producing a variety of work. The city also has live performance theater venues such as the Zachary Scott Theatre Center, Vortex Repertory Company, Salvage Vanguard Theater, Rude Mechanicals' the Off Center, Austin Playhouse, Scottish Rite Children's Theater, Hyde Park Theatre, the Blue Theater, The Hideout Theatre, and Esther's Follies. The Victory Grill was a renowned venue on the Chitlin' circuit. Public art and performances in the parks and on bridges are popular. Austin hosts the Fuse Box Festival each April featuring international, leading-edge theater artists. The Paramount Theatre, opened in downtown Austin in 1915, contributes to Austin's theater and film culture, showing classic films throughout the summer and hosting regional premieres for films such as Miss Congeniality. The Zilker Park Summer Musical is a long-running outdoor musical. The Long Center for the Performing Arts is a 2,300-seat theater built partly with materials reused from the old Lester E. Palmer Auditorium. Ballet Austin is the fourth largest ballet academy in the country. Each year Ballet Austin's 20-member professional company performs ballets from a wide variety of choreographers, including their international award-winning artistic director, Stephen Mills. The city is also home to the Ballet East Dance Company, a modern dance ensemble, and the Tapestry Dance Company which performs a variety of dance genres. The Austin improvisational theatre scene has several theaters: ColdTowne Theater, The Hideout Theater, The New Movement Theater, and The Institution Theater. Austin also hosts the Out of Bounds Improv Festival, which draws comedic artists in all disciplines to Austin. Museums in Austin include the Texas Memorial Museum, the Blanton Museum of Art (reopened in 2006), the Bob Bullock Texas State History Museum across the street (which opened in 2000), The Contemporary Austin, the Elisabet Ney Museum and the galleries at the Harry Ransom Center. The Texas State Capitol itself is also a major tourist attraction. The Driskill Hotel built in 1886, once owned by George W. Littlefield, and located at 6th and Brazos streets, was finished just before the construction of the Capitol building. Sixth Street is a musical hub for the city. The Enchanted Forest, a multi-acre outdoor music, art, and performance art space in South Austin hosts events such as fire-dancing and circus-like-acts. 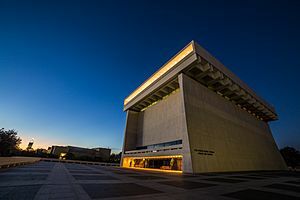 Austin is also home to the Lyndon Baines Johnson Library and Museum, which houses documents and artifacts related to the Johnson administration, including LBJ's limousine and a re-creation of the Oval Office. Locally produced art is featured at the South Austin Museum of Popular Culture. The Mexic-Arte Museum is a Mexican and Mexican-American art museum founded in 1983. Austin is also home to the O. Henry House Museum, which served as the residence of O. Henry from 1893 to 1895. Farmers' markets are popular attractions, providing a variety of locally grown and often organic foods. Austin also has many odd statues and landmarks, such as the Stevie Ray Vaughan statue, the Willie Nelson statue, the Mangia dinosaur, the Loca Maria lady at Taco Xpress, the Hyde Park Gym's giant flexed arm, and Daniel Johnston's Hi, How are You? Jeremiah the Innocent frog mural. The Ann W. Richards Congress Avenue Bridge houses the world's largest urban population of Mexican free-tailed bats. Starting in March, up to 1.5 million bats take up residence inside the bridge's expansion and contraction zones as well as in long horizontal grooves running the length of the bridge's underside, an environment ideally suited for raising their young. Every evening around sunset, the bats emerge in search of insects, an exit visible on weather radar. Watching the bat emergence is an event that is popular with locals and tourists, with more than 100,000 viewers per year. The bats migrate to Mexico each winter. The Austin Zoo, located in unincorporated western Travis County, is a rescue zoo that provides sanctuary to displaced animals from a variety of situations, including those involving neglect. The Austin Parks and Recreation Department received the Excellence in Aquatics award in 1999 and the Gold Medal Awards in 2004 from the National Recreation and Park Association. Home to more than 50 public swimming pools, Austin has parks and pools throughout the city. There are several well-known swimming locations. 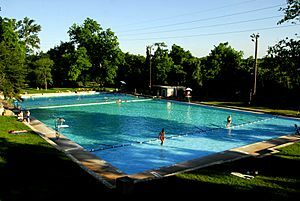 These include Deep Eddy Pool, Texas' oldest man-made swimming pool, and Barton Springs Pool, the nation's largest natural swimming pool in an urban area. Barton Springs Pool is spring-fed while Deep Eddy is well-fed. Both range in temperature from about 68.0 °F (20.0 °C) during the winter to about 71.6 °F (22.0 °C) during the summer. Hippie Hollow Park, a county park situated along Lake Travis, is the only officially sanctioned clothing-optional public park in Texas. Activities include rockclimbing, kayaking, swimming, mountain biking, exploring, and hiking along the greenbelt, a long-spanning area that runs through the city. Some well known naturally forming swimming holes along Austin's greenbelt include Twin Falls, Sculpture Falls and Campbell's Hole. Zilker Park, a large green area close to downtown, forms part of the greenbelt along the Colorado River. Hamilton Pool is a pool and wildlife park located about 30 minutes from the city. To strengthen the region's parks system, which spans more than 29,000 acres (11,736 ha), The Austin Parks Foundation (APF) was established in 1992 to develop and improve parks in and around Austin. APF works to fill the city's park funding gap by leveraging volunteers, philanthropists, park advocates and strategic collaborations to develop, maintain and enhance Austin's parks, trails and green spaces. APF fosters innovative public/private partnerships and since 2006, has given over 145 grants totaling more than $2 million in service to the greater Austin community. Of all the people who work in Austin, 73% drive alone, 10% carpool, 6% work from home, 5% take the bus, 2% walk, and 1% bicycle. Central Austin lies between two major north-south freeways: Interstate 35 to the east and the Mopac Expressway (Loop 1) to the west. U.S. Highway 183 runs from northwest to southeast, and State Highway 71 crosses the southern part of the city from east to west, completing a rough "box" around central and north-central Austin. 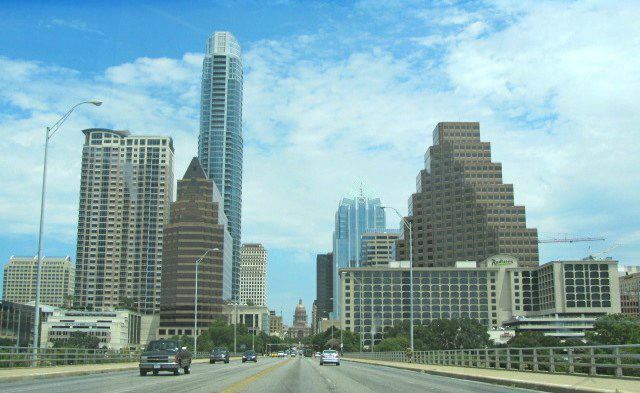 Austin is the largest city in the United States to be served by only one Interstate Highway. U.S. Highway 290 enters Austin from the east and merges into Interstate 35. Its highway designation continues south on I-35 and then becomes part of Highway 71, continuing to the west. Highway 290 splits from Highway 71 in southwest Austin, in an interchange known as "The Y." Highway 71 continues to Brady, Texas, and Highway 290 continues west to intersect Interstate 10 near Junction. Interstate 35 continues south through San Antonio to Laredo on the Texas-Mexico border. Interstate 35 is the highway link to the Dallas-Fort Worth metroplex in northern Texas. There are two links to Houston, Texas (Highway 290 and State Highway 71/Interstate 10). Highway 183 leads northwest of Austin toward Lampasas. In the mid-1980s, construction was completed on Loop 360, a scenic highway that curves through the hill country from near the 71/Mopac interchange in the south to near the 183/Mopac interchange in the north. 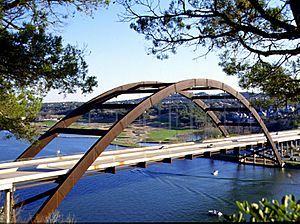 The iconic Pennybacker Bridge, also known as the "360 Bridge", crosses Lake Austin to connect the northern and southern portions of Loop 360. State Highway 130 is a bypass route designed to relieve traffic congestion, starting from Interstate 35 just north of Georgetown and running along a parallel route to the east, where it bypasses Round Rock, Austin, San Marcos and New Braunfels before ending at Interstate 10 east of Seguin, where drivers could drive 30 miles (48 km) west to return to Interstate 35 in San Antonio. 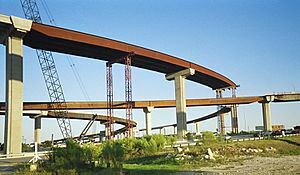 The first segment was opened in November 2006, which was located east of Austin–Bergstrom International Airport at Austin's southeast corner on State Highway 71. Highway 130 runs concurrently with Highway 45 from Pflugerville on the north until it reaches US 183 well south of Austin, where it splits off and goes west. The entire route of State Highway 130 is now complete with last leg, which opened on November 1, 2012. The highway is noted for having the entire route with a speed limit of at least 80 mph (130 km/h). The 41-mile section of the toll road between Mustang Ridge and Seguin has a posted speed limit of 85 mph (137 km/h), the highest posted speed limit in the United States. State Highway 45 runs east-west from just south of Highway 183 in Cedar Park to 130 inside Pflugerville (just east of Round Rock). A tolled extension of State Highway Loop 1 was also created. A new southeast leg of Highway 45 has recently been completed, running from US 183 and the south end of Segment 5 of TX-130 south of Austin due west to I-35 at the FM 1327/Creedmoor exit between the south end of Austin and Buda. The 183A Toll Road opened March 2007, providing a tolled alternative to U.S. 183 through the cities of Leander and Cedar Park. Currently under construction is a change to East US 290 from US 183 to the town of Manor. Officially, the tollway will be dubbed Tollway 290 with the Manor Expressway as a nickname. Despite the overwhelming initial opposition to the toll road concept when it was first announced, all three toll roads have exceeded revenue projections. Austin's airport is Austin–Bergstrom International Airport (ABIA) (IATA code AUS), located 5 miles (8 km) southeast of the city. The airport is on the site of the former Bergstrom Air Force Base, which was closed in 1993 as part of the Base Realignment and Closure process. Previously, Robert Mueller Municipal Airport was the commercial airport of Austin. Austin Executive Airport serves the general aviation coming into the city, as well as other smaller airports outside of the city centre. Greyhound Lines operates the Austin Station at 916 East Koenig Lane, just east of Airport Boulevard and adjacent to Highland Mall. Turimex Internacional operates bus service from Austin to Nuevo Laredo and on to many destinations in Mexico. The Turimex station is located at 5012 East 7th Street, near Shady Lane. Megabus offers daily service to San Antonio, Dallas/Fort Worth and Houston from a stop at Dobie Center. Capital Metropolitan Transportation Authority Capital Metro provides public transportation to the city, primarily by bus. Capital Metro is planning to change some routes to "Rapid Lines." The lines will feature 60 ft (18 m) long, train-like, high-tech buses. This addition is going to be implemented to help reduce congestion. Capital Metro opened a 32-mile (51 km) commuter rail system known as Capital MetroRail on March 22, 2010. The system was built on existing freight rail lines and serves downtown Austin, East Austin, North Central Austin, Northwest Austin, and Leander in its first phase. Future expansion could include a line to Manor and another to Round Rock. 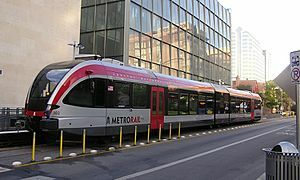 Capital Metro is also looking into a light rail system to connect most of Downtown, the University of Texas at Austin, and the 700-acre (2.8 km2) Mueller Airport Redevelopment. The light rail system would help connect the MetroRail line to key destinations in Central Austin. On August 7, 2014, the Austin City Council unanimously voted to place a $600 million light rail bond proposal on the November 4, 2014 ballot. Implementation of this package is contingent on matching funding from Federal transit grants. If Federal funding is available, Austin would begin construction of a light rail line that would run from Riverside Drive to the Highland Austin Community College Campus. Capital Area Rural Transportation System connects Austin with outlying suburbs. An Amtrak Texas Eagle station is located in west downtown. Segments of the Amtrak route between Austin and San Antonio are under evaluation for a future regional passenger rail corridor as an alternative to the traffic congestion of Interstate 35. This is a multi jurisdictional project called Lone Star Rail. Austin is also home to Car2Go, a carsharing program. Austin was chosen as the first city in the western hemisphere to host this company's business, which is based in Germany. Austin is known as the most bike-friendly city in Texas, and was ranked the #7 city in the US by Bicycling Magazine in 2016. Austin has a Silver-level rating from the League of American Bicyclists. The city's bike advocacy organization is Bike Austin. Bike Texas, a state-level advocacy also has its main office in Austin. Bicycles are a popular transportation choice among students, faculty, and staff at the University of Texas, Austin. According to a survey done at UT, 57% of commuters bike to campus. A 2013 study by Walk Score ranked Austin 35th most walkable of the 50 largest U.S. cities. This is considered a medium low ranking. List of sister cities of Austin, Texas, designated by Sister Cities International. The cities of Belo Horizonte, Minas Gerais, Brazil and Elche, Alicante, Valencian Community, Spain were formerly sister cities, but upon a vote of the Austin City Council in 1991, their status was de-activated. The 8-story U.S. Courthouse constructed at a cost of $123 million is located at Fourth, Fifth, San Antonio, and Nueces streets in Austin (opened December 2012). Darrell K Royal-Texas Memorial Stadium, home of Texas Longhorns football. Austin, Texas Facts for Kids. Kiddle Encyclopedia.